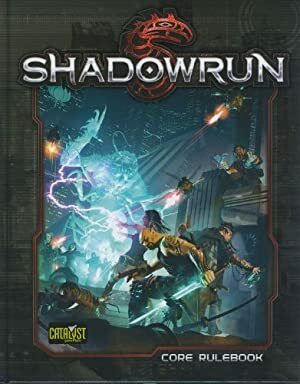 Shadowrun is a tabletop role-playing game whose first edition was released in 1989. The game world is an intriguing mix of cyberpunk and fantasy. It is a dystopic near-future world with megacorporations, virtual-reality cyberspace and cybernetic implants where magic and magical creatures have made their thunderous return. Dragons run some major corporations. Neo-tribal shamans conjure serpent spirits. Entirely privatized paramilitary police forces field hovertanks and swarms of drones. Many persons have “awakened” and mutated into elves, orcs or trolls. Freelance hackers engage hardened computer security that could leave them dead through feedback. This specific character was from a RPG campaign of mine. It was about a peculiar police unit of the Lone Star corporation, called Discipline Seven. She received a writeups.org profile as a consequence of insomnia. Real Name: Céline Marie-Sophie Agnès McGowan. Other Aliases: Echo Zombie, “She Who Must Be Obeyed”. Base Of Operations: Redmond Barrens. Height: 5’9” Weight: 142 lbs. Eyes: Gray Hair: Graying brown. Lone Star – the premier megacorporation selling police and security services in America. FRT – Fast Response Team, a basic tactical response team from Lone Star. SWAT – Special Weapons And Tactics, a type of Lone Star tactical response team with specific equipment and a robust level of training and experience. Max Tac – short for Maximum Tactical Response, the toughest, most heavily-armed, most versatile, most experienced Lone Star tactical officers. Seattle – this city occupies a special place in Shadowrun‘s America, for political and geographical reasons. Traditional Shadowrun campaigns take place there. Retractable claws on both hands. A computerized sense of balance. Each of her forearms contains a slim tube that can propel a sort of explosive crossbow bolt with extreme force – a last resort weapon. Her body is worth megabucks, and her enhancements have been routinely replaced by the best, latest and less intrusive for years. McGowan benefits from the lifetime Max Tac medical coverage, giving her essentially unlimited warranty for her cybenetics and free maintenance and upgrades. At 43, she is one of the most experienced tactical operators in the country. She has proved time and again that superior tactics, training and experience can defeat big-time firepower. McGowan is sharp, authoritative and intensely charismatic. Many people who have worked with her are scared of her. She can project a crushing, palpable aura of menace and authority without even trying. It makes even hardened killers feel very small and in need of a hiding place. When McGowan says jump, people most definitely leap. The McGowans are French-Canadians who emigrated to the US two generations ago. Céline was the first child of the McGowans who wasn’t taught French. Preferring physical action to studying, she applied to Lone Star’s riot control division at 19. That was on the strength of her qualifications as an amateur boxer. She proved to be a serious, disciplined cop and was transferred to the patrol division. From there she was poached by the recruiters of Lone Star’s Fast Response Teams. Officer McGowan excelled with the tactical work of the FRTs. However, she ran into a major discipline issue when a group of drunken FRT officers hurled homophobic insults at her in a police bar. The catastrophic brawl that ensued left numerous officers hospitalised. It made it impossible to keep Officer McGowan with the FRTs despite her superb track record. As it turned out, the human resources for the Special Weapons And Tactics teams had had her file tagged for a while. Thus, McGowan’s transfer to Discipline Three lasted all of one week before she joined the SWAT training program. She passed with the highest scores for that year. McGowan broke the Lone Star record for the longest continuous service as a SWAT operator. She clocked in at five years as an assault and close quarter battle specialist. The ascension of Céline McGowan from street-grunt-with-a-shield to the tactical elite reached its pinnacle when she was approached by Lieutenant Blackbone. The Lt. was the leader of one of Lone Star’s three Max Tac teams in Seattle – Team Crossbones. Lt. McGowan co-led Crossbones for two years. However, this team was the darling of Lone Star’s Seattle PR team. They wanted Crossbones deployed whenever possible. And Seattle presented a never-ending stream of issues that actually required the crushing firepower of a Max Tac team. Even with her exceptional mental endurance, McGowan cracked after two years with Team Crossbones’s unbearable schedule. She stepped down with honours, and was promoted to Captain. However, Captain McGowan was unable to adjust back to anything resembling a normal life. A slight case of PTSD also crept in. She became unable to function in a normal Lone Star environment. Céline had but two speeds left – vacation or Max Tac. She also had developed a problem with authority after years of taking on-the-spot tactical decisions. Some leeway was arranged to keep her on the payroll without actually working much. But this came to a head after Céline provided security consulting services for the Pacific Northwest Gay-Straight Alliance. A senior officer who loathed her had her discharged for infringing her non-competition clause. This degenerated into a personal confrontation between the two, long-hidden homophobic resentment bursting out, and murder. For several hours Lone Star faced the possibility of a Max Tac officer going amok at the heart of the corporate headquarters. The situation was brought under control when friends of McGowan reached the scene to talk to her. Pressures were exerted to have the entire chain of events go /dev/null . Captain McGowan was demoted to Master Sergeant and transferred to Discipline Seven. After but a week with D7, McGowan saw Sergeant Goldberg, the commanding officer of the “precinct”, go psycho. She had to terminate the heavily cybernetised Sergeant as he went on an uncontrollable rampage. With Goldberg gone, she was next in line to become CO .
Master Sergeant McGowan has been the commanding officer of Discipline Seven for eight years now. Much of what D7 has become can be laid at her feet. Particularly the role of D7 as a black ops SWAT team, which did not exist before. Discipline Seven can easily be described as a successful precinct. It has handled a lot of favours and difficult corner cases for the rest of Lone Star Seattle. Céline McGowan has been in a relationship with the FBI’s Special Agent Megan O’Rourke for nearly ten years now. O’Rourke, an Elven mage doing paranormal investigation work, has occasionally arranged for cooperation between D7 and the Bureau on a private contractorship basis. She has also been unofficially detached by the Bureau to work off-the-record with McGowan’s unit on several cases. The two are considering marriage. Lone Star — the leading corporation in private law enforcement services across America — has a system of disciplinary units for problem officers. These are ranked from one to five. Discipline One (D1) is a patrol unit for retraining officers through a few weeks of harsh work and remedial instruction. Discipline Five (D5) is essentially a penitentiary for mad dogs that Lone Star wants out of circulation to limit past and future legal exposure. This is all explained in the manual you get when they hire you. Discipline Seven, however, isn’t in the manual. Many veteran officers have heard about it, but it’s understood that it’s best not to talk about it. D7 is a dumping ground for corner cases. That is, officers who should by all means be retired but who have special talents that Human Resources is loathe to lose. About half the officers assigned there only have discipline issues on paper. Many were shifted to D7 after political or PR issues made them too hot to touch. Or because of wounds that should officially prevent them from resuming an active service. Or for some other reason best kept under the carpet. Each person in D7 has a story, and it’s best to never ask about it. Discipline Seven is headquartered in the arse end of the Redmond Barrens. This area redefines the notion of “urban wasteland”. Called Redmond November on Lone Star maps, this sector is a lawless, burnt out, shapeless, low-population area where nobody can present any valid identification. There are a few gangs/tribes roaming about, and that’s about it. The budget for D7 probably couldn’t buy breakfast at a fancy hotel. The “precinct” is a mud field surrounded by rotten concrete walls and huge rolls of concertina wire. It hosts four grungy prefabs with broken windows. The “MINES” placards lost in the mud are generally thought to be genuine, though. The cases that are discreetly handed over to Discipline Seven are heteroclite. Their only common point is that Lone Star can’t quite touch them and would rather have unconventional and mostly deniable assets have a look. Who gets to float a case in D7’s direction follows no clear procedure. It is often more a case of having enough seniority and knowing enough old hands within Lone Star to have it done. Cases that were almost certain to lead to PR disasters. Cold cases that had to be abandoned but were still eating at individual detectives with enough pull to get something done. A surprising number of tactical operations. The tactical work usually occurs when Lone Star has reasons to believe that their assault teams are being monitored. For years senior Lone Star people have suspected that officers deep within the SWAT units are corrupt and sell intelligence about ongoing operations. Discipline Seven officers have also been known to pursue their own cases. Céline McGowan is 43. She’s a hard-looking, severe woman with prematurely greying hair pulled into a strict bun. She has a hoarse, deep voice thanks to decades of smoking. When she left Max Tac she went from being a moderate smoker to four packs a day. Her cop stare and her cop voice are legendary for their power of intimidation. There are persistent rumours that she once won a staredown contest against some sort of undead monstrosity during a tactical op. However, the type of creature varies depending on who’s telling the tale. Another persistent rumour is that there are etched marks on the pistol grip of her Colt Manhunter. These supposedly are special Max Tac code denoting the number of people she’s killed during tactical operations. The most oft-quoted number is 800 kills. In actuality, McGowan’s Manhunter has no such marks. These are just scratches – it’s been her sidearm for more than 15 years now. McGowan’s seeping PTSD during her tactical years led to a number of morbid customisations made to her uniform as the years went by. Her seniority let her get away with it. She wears a black velvet band around the neck, with an ivory skull on the throat. The “O” in the “Lone Star” inscription on the back of her uniform jacket was slightly altered to look like a death’s head. One of her earrings is a black sun with the inscription “Helios Mortis” on a plaque under it. She has a skull-shaped, chromed armour plate on the back of her left uniform glove. It has the inscription “Væ Mortis” etched on it with acid. She hanged a small Judge Death action figure under the rear-view mirror in her D7 patrol car. The red door of her D7 office has been painted black. It bears the inscription “Man’s only hope for salvation is redemption ; man’s only hope for redemption is death”. Another bit of customisation allowed to elite units is her radio callsign. Officially she is “Max Tac Echo Zulu” (Max Tac operators retain their Max Tac callsign even after leaving the unit). But veteran officers in Seattle know that “it’s written Echo Zulu, but pronounced Echo Zombie”. Even dispatchers identify her as Echo Zombie during radio communications. Since McGowan is not supposed to be an active Lone Star officer, the “Echo Zombie” callsign has acquired an ironic character. It is an undead radio identifier. Likewise, nearly all tactical officers and most Lone Star field veterans continue to salute and address her as “Captain”. This more recent recruits since she’s evidently wearing Master Sergeant stripes and has no visible unit identifier. Seeing Lieutenants salute a Sergeant wearing a blatantly customised uniform with next to no identifiers signals even the densest rookie that it’s best to shut up and look the other way. McGowan is a rock. She displays about the same emotional range and self-expression as a large piece of granite. Her stony, starkly disciplined demeanour is taciturn. Her leadership usually consists in a handful of brief, sharp instructions conveyed in sentence fragments of three words or less and in an even tone. She doesn’t have to say much more. Her raw presence is scary enough to make discipline and motivation issues moot. And she believes in letting individual officers find their own solutions rather than be micromanaged. The Master Sergeant thinks nothing of being in the field and leading tactical operations. She’s been through thousands of those. What others call a horrible, desperate situation that is getting out of hands in a ugly manner, she calls Tuesday. Officially, Master Sergeant McGowan is unable to serve. Due to extensive psychological damage and severe PTSD requiring specialised medical monitoring. But this was just a pretext to send her to Discipline Seven. In actuality she’s just taking a mess of pills daily. The medication is working fine, the disorder is frankly mild in proportion to the number of years she worked tactical. With the pills the worse symptoms are occasional nightmares. About the only way to be damagin’ her calm is homophobic slurs. McGowan reacts notoriously poorly to those. She has, in fact, *issues* with such insults. These issues can lead to violence. Men have actually died over those – that’s why she’s commanding Discipline Seven. The stony, chain-smoking, taciturn super-cop with soulless cyber-eyes is reputedly much more relaxed and even cheerful in her private life. But her fiancée is not talking and nobody is enough of a fool to ask personal questions to the couple. 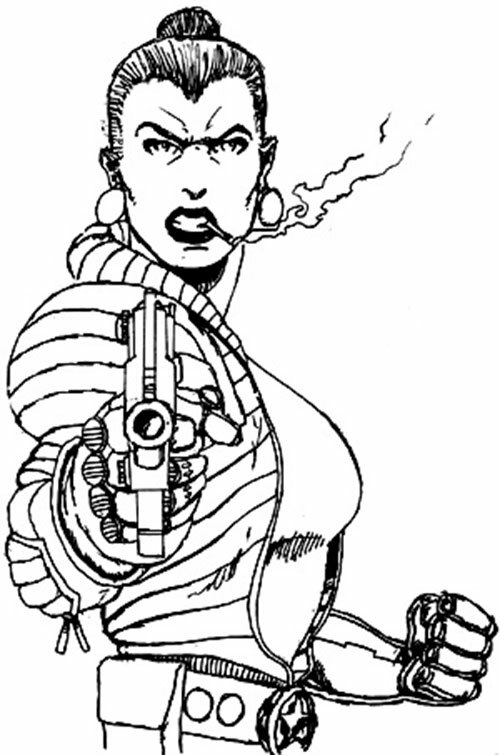 Special Agent O’Rourke was not just nicknamed “the Irish Fireball” for her hair and looks. She has a disquieting tendency to blow stuff up. Projectile weapon has Ammo: 04. Acrobatics and the top two APs of Weaponry are Powered Skills (balance-maximising implants, target acquisition computers, etc.). Area Knowledge (Seattle), Expertise (Tactical police work), Iron Nerves, Lightning Reflexes, Mystique (Seattle), Police Rank (effectively Captain), Sharp Eye, Schtick (Double-tapping, Shotgun woman, Speed-shooting). Discipline Seven (High), Street (Low), Lone Star Max Tac dept. 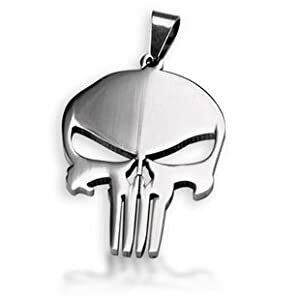 (High), Special Agent O’Rourke (High), Team Crossbones ex-members (High). MIH of homophobic remarks, MIH of copkillers. .41 magnum semi-auto handgun [BODY 04, Projectile weapons: 05, Ammo: 12]. Tactical radio headset [BODY 04, Radio communications (Encrypted): 04]. LONE STAR UNIFORM [BODY 06, Skin armour: 02, Invulnerability: 05, Limitations : Skin armour and Invulnerability only vs. blades and bullets, Partial coverage (long coat), Drawback: Real armour]. Dual-box feed tactical shotgun [BODY 05, Projectile weapons (Diminishing): 06, Range: 03, Ammo: 06, Recommended STR: 04, Advantage: Scattershot, Limitation: Projectile weapons has No Range – use the Range given next instead] and [BODY 05, Projectile weapons: 06, Sharpness (Projectile weapons): 02, Range: 04, Ammo: 06, Recommended STR: 04, Limitation: Projectile weapons has No Range – use the Range given next instead]. – Reinforced body — Enhanced Strength 3, Enhanced Stamina 2. – Cyber-eyes — Enhanced Fortitude 4 (Limited 3 – to Bright Light), Enhanced Awareness 1, Senses 3 (Darkvision, Infravision). – Cyber-ears — Senses 4 (Accurate Hearing, Extended hearing, Ultrahearing). – Augmented legs — Speed 4, Leaping 3. – Retractable claws — Strength-based Slashing Damage 1. – Last-resort bolt projector — Ranged Damage 6 (Limited Range 3, Subtle, Limited 1 (Four shots)). – Wired reflexes — Enhanced Agility 3, Enhanced Fighting 4, Evasion 1, Improved Initiative 2, Defensive Roll 2. – Computer-assisted moves — Enhanced Dexterity 3, Accurate Attack, Ranged attack 6, Second chance (Losing her balance), Acrobatics 4 (+9), Athletics 7 (+12). Buckshot — Shotgun blast 5. APDU slugs — Ranged Ballistic Damage 5 Armour Piercing 3 Diminished Range 1. Accurate Attack, Close attack 3, Defensive Roll 2 (4 w/Cyberware), Evasion 1, Great Endurance, Improved Critical 2 (Firearms), Improved Initiative 2, Improved Smash, Power attack, Ranged attack 6, Second chance (Losing her balance), Uncanny Dodge (Mental). Assessment, Benefit 3 (Veteran Lone Star Captain), Contacts, Connected, Daze (Intimidation), Equipment 6, Fearless, Inspire 2, Leadership, Startle. Acrobatics 4 (+9), Athletics 7 (+12), Close combat (Unarmed/claws) 3 (+12), Deception 4 (+7), Expertise (Tactical police) 13 (+14), Expertise (Seattle lore) 4 (+5), Expertise (Streetwise) 4 (+5), Insight 5 (+8), Intimidation 6 (+9), Investigation 4 (+5), Perception 5 (+9), Persuasion 3 (+6), Ranged combat (Firearms) 1 (+12), Stealth 4 (+8), Treatment 4 (+5) (Limited 2 – Revive and Stabilise only), Vehicles 4 (+8) (Limited 2 – common land vehicles). Duty To serve and protect. Temper Reacts violently to homophobic slurs. Temper Hates copkillers, may look for ways to eliminate them with plausible deniability. Responsibility with Special Agent Megan O’Rourke. Trade-off areas Attack & Effect PL 9, Dodge/Toughness PL 10, Parry/Toughness PL 01, Fort & Will PL 8. Point total 202. Abilities 38, Defences 19, Skills 29, Powers 69, Devices 16, Advantages 29. Equiv. PL 14. Source of Character: An old Shadowrun campaign.